Over the hill doesn't mean out of life. It simply means you're picking up speed and living each day to the fullest. What better way to end each of those days than with a cold beer? This celebratory bucket is filled with four quality beers from reputable brands. Deliver the basket in person and share a beer with someone special, or have it delivered directly and pay your respects from a distance. 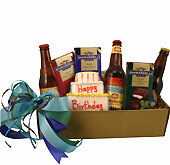 Either way, your loved one will know that you're thinking of them on one of the most important birthdays of their life. My brother loves beer (he just turned 47 on Valentines Day). I wanted to get him something unique, so I bought the over the hill gift bucket. Great choice, He had never seen 2 of the beers, which is very unusual. The alien beer bottle is very original looking! He loved the almonds and all of the other treats. 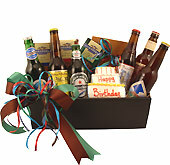 Thanks beergifts, keep searching for great tasting one of kind beer! Sent the basket as a birthday gift to my brother a day he loved it. Shipped faster than promised. Thank you.